In fifth and sixth grades, the classes have been working on a dance unit. The fifth grade has learned the Virginia Reel, a popular dance during the Revolutionary War period. The sixth grade has been concentrating on learning different square dances which became popular during the Western expansion of our nation’s growth. Both classes have also learned modern line dances, and the students have enjoyed the unit. Under the direction of Miss Algeo and assisted by Mr. Harris, the children had a hoe-down on Jan. 9 to showcase the dances learned over the last months. The unit now in progress is basketball, with students learning the basic skills of the sport: dribbling, passing, and catching. In addition, the children will be practicing shooting a variety of shots used in the games. This year, students will also work on playing man-to-man defense, which is necessary to understand and execute in any game. After a couple of weeks of learning the game, the children will be grouped to play competitive games during class. The children in grades 5-8 have the opportunity to participate in intramural basketball and play on the travel teams against other schools. 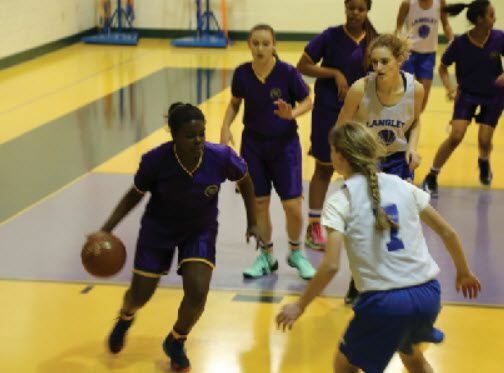 The Varsity Girls and Boys played one game before Christmas at the Woods Academy, with the girls winning and the boys losing a difficult game. Both JV teams battled Woods at home in close games, but Woods won both in the fourth quarter. In intramurals, the teams played in a kick-off tournament, with the Orange Crush winning in the seventh and eighth grade and the Green Hornets capturing the fifth- and sixth-grade title. Games will continue through the month of March to allow the children to sharpen their skills and to enjoy the competition.